I can’t think of fifth grade without cringing from embarrassment. While I consciously blocked out all of the mortifying things that can happen to a prepubescent 10-year-old, there are some memories I just can’t forget. Like the patriotic windbreakers I wore on a weekly basis or the “just chillin’” snowman graphic t-shirt I thought was acceptable to wear all year round. Unfortunately, my mom kept a nice record of my early fashion faux-pas across several photo albums. While she may not be capturing my fashion transformations anymore, my social media accounts are broadcasting them for the world and cataloguing them so I can not-so fondly look back and see the horrendous body-con skirts I thought were cute in college. As much as I like to think my style has evolved enough so I wear solely flattering and timeless pieces, my wardrobe (and current outfit) says otherwise. I'm a sucker for trends. And this season especially, the 70s, 80s and early 2000s are back in full force, reminding us history will always repeat itself, and flared pants (skinny jeans, who? ), crop tops and platform shoes always come back in (and out of) style. We rounded up 10 pieces you can find in the most fashionable and reliable stores you’re sure to regret wearing in five years. I personally can't wait until my next paycheck so I can go out and buy the metallic platform sandals I've been eyeing in Topshop. I love being tall, and I love being comfortable. So a platform shoe is a win-win -- until elegant pointy-toe heels make you wonder why you ever lugged around such an offensive shoe. Aka the grownup sibling of the body-con miniskirt. Unless you have a perfectly flat stomach or your shirt is oversized and covers a significant portion of your body, tube skirts are not flattering. As we age alongside our bodies, it becomes more and more difficult to pull off this look anywhere outside a college town. I can guarantee we'll look back at the suede fringe jackets and make jokes about cowboys and wannabe 70s icons. Unnecessary and polarizing, fringe is the exact opposite of classic. Fur coats will never go out of style -- at least according to me. Fur purses, on the other hand, probably will. Sure, it's the perfect dinner-date accessory, but you'll LOL when you show your children old Facebook photos of you carrying cards inside a hamster. I'm only 23, but I've already seen two instances of the resurgence of flared pants, which basically promises they'll go back out of style within the year (or season). 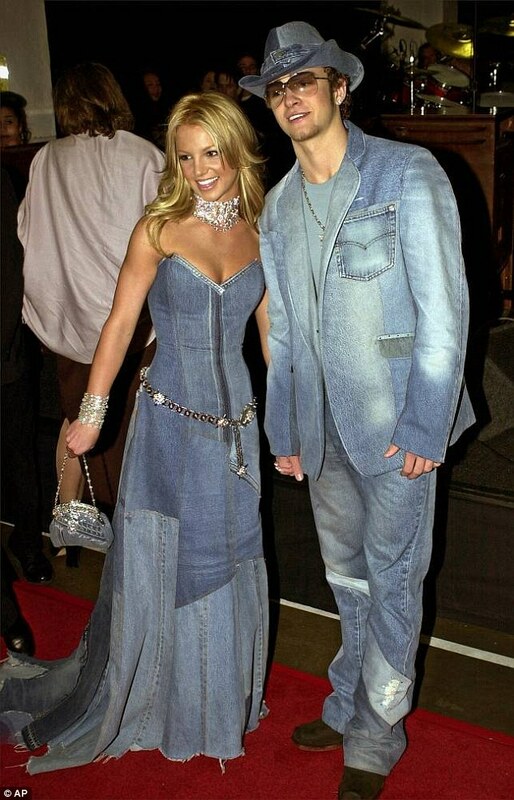 How many times will this infamous photo of Britney Spears and Justin Timberlake come back to haunt them? While this particular version of the Canadian tux is a bit more flattering, it's certainly not something we'll be proud of when we're 40. I'm already kind of regretting this one now. Our more mature selves will be judging us, wondering why we paid $40 for less than a foot of fabric (while simultaneously reminiscing on the toned bodies we once had). Just like cropped shirts, cutout dresses will eventually get sh*t for their lack of material and weird shapes. You may have found the perfect balance between showing skin and staying classy, but cutouts will eventually become the bandage dresses of yore. I've had to constantly remind myself a graphic tee isn't an investment piece. It's a statement piece. And you can only wear it like, one time before you become that girl who always wears the same memorable shirt. Comfy, but not that cute. Easy to throw on, but far from flattering. You'll wish you hadn't wasted money on these the moment you see a picture of MC Hammer.